By Robert L. Searles Jr.
How many people find that they are one day nodding off to the ramblings of their grandparents, only to later wish they could return and listen? Do the elders of past generations really have nothing relevant to say? Why are so many then intent on remembering their words after they have passed on? 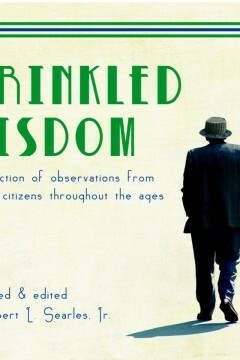 In Wrinkled Wisdom, author Bob Searles has collected an enlightening collection of humorous, practical, and inspirational quotes from those in their second half-century of life. Readers will find themselves reaching for this resource as an entertaining look at the astute and poignant sayings from people throughout the ages. Bob has systematically hunted through over 30,000 quotes to bring the reader the best three hundred from sources over 55 years of age. Wrinkled Wisdom is the perfect gift for grandparents, grandchildren, speakers, authors, or anyone with a mind that is curious about the deep wisdom found with age. Bob has held careers as a tax accountant, financial consultant, and estate– planning attorney. He holds a Bachelor’s degree in History from Middlebury College, law degree from William Mitchell College of Law and Master’s of Law in Taxation from Boston University Law School. Bob resides with Pamela, his wife of 31 years, near Minneapolis, Minnesota. The couple has two adult children whom they adopted from Honduras as infants in 1989.